University of Arizona journalism faculty member Kim Newton felt like a rock star after presenting new South Korean President Moon Jae-in a framed photo that Newton took 30 years ago during the country's democracy movement. 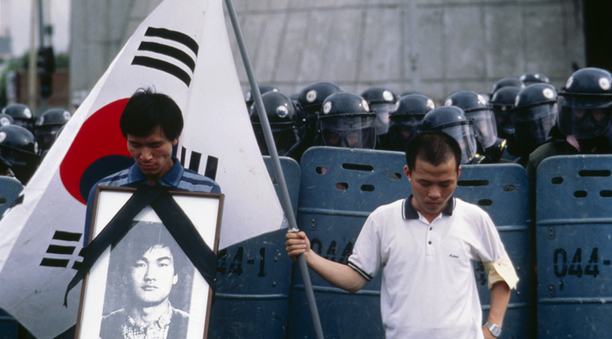 In a ceremony marking the uprising in downtown Seoul held in June, Newton gave the president a signed copy of the image and a letter explaining the July 1987 photo. The image shows two students mourning the loss of their classmate, Lee Han-yeol, killed during the student movement the month before. The uprising led to the fall of the government and South Korea's first free democratic elections. Newton, 64, said thousands attended the outdoor rally at a park. "This old-guy photographer at the end of his life has been revived," he joked. "After the ceremony, kids came up to me and all wanted selfies and autographs." 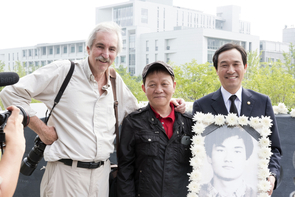 One of the students in the 1987 photo, Woo Sang-ho, is now an assemblyman and helped arrange Newton's meeting with Moon after filmmaker Kim Man-jin, who is doing a documentary on the uprising, invited Newton to South Korea for a second time this year. Moon thanked Newton and called the photograph "very historic." "For 30 years, I have followed South Korean politics and was always proud of the small role I played as an international photojournalist in the birth of this young democracy," Newton told Moon in the letter. Newton was a freelance photojournalist based in Tokyo and Seoul from 1982 to 1990 for U.S. News & World Report, The New York Times, Forbes, Business Week, People, Time, Le Fiagaro and others. Now an associate professor of practice in journalism, Newton has been at the UA since 2007 after working as a photo editor for Reuters in London and for Knight Ridder/Tribune in Washington, D.C. In March, shortly before courts upheld the impeachment former President Park Geun-hye, Newton returned to South Korea as part of Kim's planned documentary about the 30th anniversary of the student uprising. Kim tracked down Newton through the professor's 1987 photo, which had run in U.S. News & World Report and also hangs in assemblyman Woo's office now. Newton was instructed by Munhwa Broadcasting Corp., the second-largest broadcast company in South Korea, to put the film on hold. But Kim is raising private funds and hopes to air the documentary in mid-2018, Newton said, and plans to come to Tucson to visit the professor this fall. Six of Newton's photos are now hanging at an art exhibit at Yonsei University, where Lee Han-yeol attended and was hit with a tear-gas canister and later died. The exhibit runs until July. While visiting the exhibit, Newton re-created his historic shot with Woo and the other student, Woo Hyun, who became an actor in South Korea. "It was a really cool experience," Newton said. "There was a great deal of press surrounding my visit — and there is more coming."